David Erfle, Founder of The Junior Miner Junky newsletter joins me to further discuss a theme we have been expressing for metals investors. This theme is risk management for a sector that continues to languish. The key charts to watch are silver, SIL, and the US dollar. 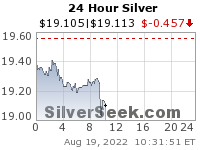 With Silver approaching the lows of late 2015 and silver stocks leading the charge down it is very concerning for gold. Also with the US dollar breaking out the overall metals complex has a lot of bearish signs in the way. We also have a quick comment on the deal announced today between Taho and Pan American Silver. Click here to visit David’s site to find out more about his newsletter. His subscriber base is full but he still has the free email blast he sends out so you can sign up for that. The foregoing charts will include today’s changes this evening. Unfortunately the bearish sentiment remains and that rules supreme over the PMs at this stage. Golden Ridge (GLDN) is an interesting spec drill play on an epithermal deposit in the Golden Triangle. The stock entered my radar when it did a round trip pop and drop, but had a nice percentage move. Unlike many one hit wonders, GLDN may really be on to something, and I’ve started to nibble at it here. Greg McCoach spoke highly of it at one of the MIF panels, and that also got my attention as he has a good eye for spotting interesting exploration stories. >> Interesting thoughts from a contributor @dmandman over at ceo relative to (GLDN) Golden Ridge story and their relationship with Barrick (ABX). Gold jumped 38% in six weeks versus oil after bottoming at the 50 year average of about 15 barrels per ounce. 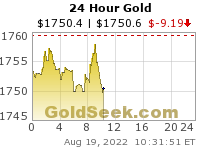 This gain will probably shrink in the days ahead but that won’t change the positive implications for the gold miners.